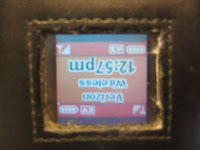 If you've tried to call me even once in the last two or three months, you've probably noticed that my Motorola RAZR V3m phone has not been kind to me. Dropped calls, random shutdowns, and just general instability. Sometimes it would freeze, and the only way to get it back would be to take out the battery and restart it. Other times it would show full signal strength, only to have not actually communicated with the cell towers all day... something I'd only find out when I plugged it in to charge and suddenly had three voicemails. What caused this to happen and how it worked this way is beyond me. Honestly, you'd have to try to program in something like that. If it weren't that I were expecting (and relying on) this device to function properly, I'd find it quite amusing. The first one the salesperson got didn't work, but he got out another one, and it's been wonderful ever since! The menu setup is very similar to that of my old phone, and it has some new features as well as improvements on old ones, including a 2-megapixel camera. The only thing I've found that I'm not thrilled with is that the recent calls list only lists the single most recent call to, from, and missed from a given number, whereas my old phone listed each individual call. I used to use that if I couldn't get a hold of someone to remind myself how many times I'd tried their number and when. But I think I'll get over not having that anymore. My parents also decided to splurge and add on a small SMS plan to the contract. Yes, that's right. Texting. Hell hath frozen over. Since the allotment is small, I probably won't be using it for much, but it's good to know it's there, especially since nowadays college students will just assume you can receive SMS. Especially since it'll help for those times when people won't answer their phones. So to those of you who know me, give me a call, send me a message! I'd love to talk sometime. Random tangent: I don't usually open birthday gifts at Christmas, but I decided to make an exception for my Uncle Dave's gift this year. I don't know why I did, because as it turns out, it was a bottle of rum. In five minutes' time, I will be able to legally consume said rum. I think I'll wait a bit longer. I'm sorry you had troubles with your previous phone. My sister had the same type of problem and had to replace her phone as well(my mom bought me a new one too:P). Happy Birthday! don't drink the rum just yet, haha. Find like a strawberry daquiri mmix bottle at the store or something and add a little rum to it, if its the right kind. Don't know why I'm helping you make alcohol taste better 'cause I refuse to drink it, but hey, might as well enjoy it? :p happy 21st once again. I guess I should add that our contract was up anyway, so the phone ends up being free after rebate. Just in case it wasn't clear that I'd had the old one for over two years. I don't know how to make it a link in a comment. Hey, this was my post for 3 January. There's still lots more of today to go! I checked it on the fourth; I thought that you had posted this about your birthday, when in fact, you got a new post for it. Psh. Never expect me not to blog something like that. Everything else, you should expect me not to blog, given how 2008 went. Hopefully I'll be doing better at that in 2009.